Local Harvest is a community project, initiated by the Ethical Consumer Group, with a view to providing a resource to make it easy to find local and more sustainable food sources. This includes a national directory for finding food co-ops, swap meets, community gardens, farmers markets, box systems, ‘pick you own’ farms, farm-gate products, organic retailers, and more. 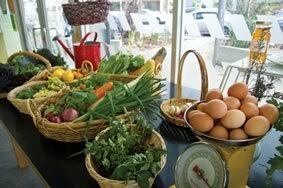 Local Harvest also promotes and explores do-it-yourself alternatives for food production and meeting essential needs, including resources for growing your own food, making your own produce, storing and preserving, low energy living. Local Harvest seeks to take people on a journey towards greater connection with their food and the processes and faces behind it. Local Harvest has a national focus. Major partners are Sustainable Table, and the Sustainable Living Foundation. The localharvest.org resource for the USA was an inspiration for this project. Listing information has been gathered from publicly available sources, or gathered when listees update their information. It is set up as a community resource and so we encourage other groups to post relevant content from this website through their own networks. This website is licenced under the Creative Commons. The work of the Ethical Consumer Group over the past 7 years have provided resources for better choices within the supermarket and introduced the many issues connected with our food and everyday consumerables. Many people have chosen to take up the challenge of more closely aligning their purchases with their values. However the present global system of food production reliant on long distance transportation, chemicals in production and storage means that the real answers are beyond the supermarket and industrial food system. For some time people have been seeking a resource to allow them to choose better alternatives that cut out the middle men and reconnects people with the producers of their food. The Ethical Consumer Group, set up to help facilitate more sustainable purchasing practices for the everyday consumer, produce an annual pocket guide, Shop Ethical! Smartphone app, and website. These focus on the companies behind common brands and the social and environmental track record of these companies. Sustainable Table uses food as an entree to explore sustainability issues. Their publication, The Sustainable Table cookbook, is a collection of recipes and stories of people who are reducing their impact on the environment by altering their food choices. The Sustainable Living Foundation run the annual Sustainable Living Festival, held at Melbourne’s Federation Square each February, which aims to inspire and empower everyday Australians to accelerate the uptake of sustainable living. Amazingly big thankyou to the startup team. Neesh Wray, Wendy Clarke, Kate Leslie, Jason Ashwell, and Campbell Imray for web design, and Will Oldmeadow for web development. Sustainable Table team for funding and support, and the ‘Green Grannie’ festival event. Special thanks to Cassie. Nina Petrie for graphics on Local Harvest promotional postcard. Christy Harris for graphics on Local Harvest Challenge postcard and poster artwork. Jock from Plump in Yarraville and Angela from Angela Organics for donation of apples for Sustainable Living Festival promotion. All those who contributed funds through Pozible Crowdsourcing. Including: Jo McLeay, Wayne Richmond, Nancy Ray, Guy Abrahams, Patrick Arnold, Campbell Imray, Simone Novello, Eytan Lenko, Liz Shannon, Jane Carlisle, Antony McMullen, Bec Plumbe, Kate Leslie, Elizabeth Collins, Gregory Crocetti, Jane Canawa, Cathy Oddie, Nick Savaidis, Jose Harnett, Mara Chambers, Bel Bird, Joshua McDougall, Maurizio Labbate, David Black, Kemmy Foo, Mat Hardy, Coby Ruskin, Bianca Moore, Catherine Marshall, Cindy Aulby, Cat Williams, Monique Burke, Tarius McArthur, Glenn Althor, Kirsten Kennedy, delia symons, Lisa McLean, Tracy Collins, Fran Murrell, Jose Harnett, Sarah Reardon, Donna Matthews, Rayna Fahey, Tara McInnes, Julia Olszewska, Bee Winfield, Ruth Butler, Adele Charlton, Karin Wylie, Eaterprises Australia, Bro Sheffield-Brotherton, Angela Ashley, Carolle St John, Vanessa Kwiatkowski, Larissa MacFarlane, Dorian Ribush, Beth Mylius, Natasa Milenovic, Alexandra Hoffman, Berice Robb, Kerrie Eather, Lucy Piggin, Elissa Newall, Anna Lancaster, Cynthia OKeefe, Bronwyn Ritchie, Kyle Vermaes, Danny Gorog, Craig Broughton, Tim Hibberd, Eytan Lenko, Frank Albrecht, Jane Kunstler, Ken Johnson, Gillian Milne, Michelle Brunsmann, Karen Retra. This community project has been initiated only through the contributions of these people. Many thanks for your work in helping develop this resource and continue the work of making ‘good food’ accessible .